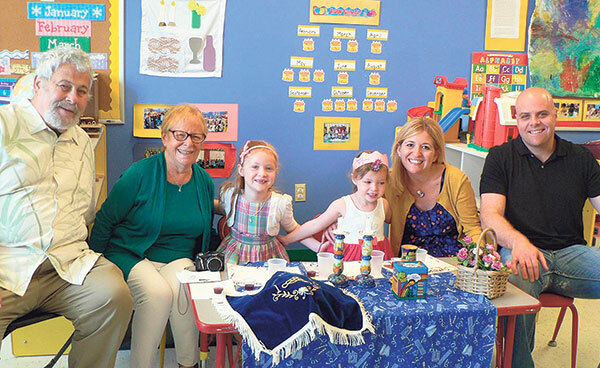 A “Shabbat girl” celebrates with her family at the Early Childhood Center of Congregation Agudath Israel in Caldwell, which is adding a class for toddlers this fall. Jacqueline and Kevin Haney of North Caldwell wanted to send their children to a Jewish preschool, so last summer they took a look at the Early Childhood Center at nearby Congregation Agudath Israel of West Essex in Caldwell. Because they both work traditional full-time hours, however, they were dubious that a synagogue preschool — even one with “extended hours” — would meet their needs. Jacqueline said that once they walked into the Agudath Israel preschool, “it was very clear it was the perfect environment. It was just very warm and welcoming and flexible.” And then, she said, they learned that the school’s hours really are “extended.” The center offers care from 7 a.m. until 6 p.m. nearly every day of the year, including most Jewish holidays and during school breaks. The Haneys signed up their daughter Julia, and now that the CAI Early Childhood Center is adding a toddler class this year, they are also enrolling Julia’s younger brother, Ethan. Across the Jewish landscape, Jewish preschools are making changes to meet the needs of parents like the Haneys. They have to. “Mostly all parents work,” said Rivka Isaacs, the new early childhood director at the Jewish Educational Center in Elizabeth, which runs its preschool four days a week, 8 a.m.-5 p.m. “And not part-time hours; they really work,” she said. A mother of 10, she herself remembers a time when she was one of very few who needed full-time care for her children in a Jewish setting. “Some mothers were looking at me like, ‘Why are you doing that?’ One mother came over to speak with me about the impact on my children,” Isaacs recalled. Those days are gone. “We don’t live in a society where we only have one parent working anymore.” A 30-year veteran professional of early childhood programs, she said she has watched a major shift take place over the last decade. Geula Zamist, Agudath Israel’s director of early childhood, pointed out that while their overall enrollment has remained steady, the number of kids in the extended day program keeps increasing. There were seven children when the service started four years ago; today there are 44. (Not all children stay from 7 a.m. until 6 p.m.; it’s just one option the preschool offers.) “I don’t know that we would have the same numbers if we didn’t have extended care,” she said. Even 10 to 15 years ago, there were few local options for full-day care, and fewer for Jewish full-day care. In 1998, for example, the only local full-day Jewish preschools with hours for working parents were the two offered by JCC MetroWest — the one at the Cooperman JCC in West Orange and the Brody preschool, then at the Aidekman campus in Whippany (the school closed in 2010) — and the early childhood center at the YM-YWHA of Union County in Union. 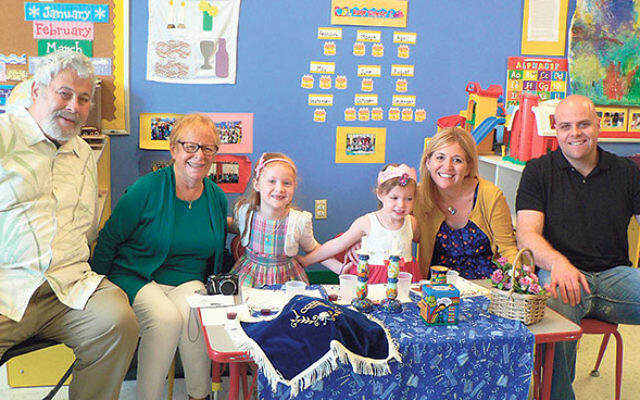 In 2003, Temple Emanu-El of West Essex in Livingston launched a full-day preschool in a bid to attract young families and avoid merging, folding, or moving. It was well ahead of its time. Fast forward and Jewish preschools are changing with the times. At least 25 percent of Reform synagogues and between 25 and 40 percent of Conservative synagogues are revamping their hours, according to Cathy Rolland, director of early childhood engagement at the Union for Reform Judaism (she previously served as director of Mountain Top School for Young Children at Temple Har Shalom in Warren), and Maxine Segal Handelman, consultant for early childhood education at United Synagogue for Conservative Judaism. Nearly all JCC early childhood centers have already adopted some kind of full-time model. While not all are open 7 a.m.-6 p.m., according to Mackenzie Noda, director of strategy and communications for the JCC Association of North America’s Sheva Center, they are similar. In fact, JCCs were for decades the only Jewish option for working parents. As early as the 1980s, pregnant women would put their names on the wait list for a child-care spot at the Union Y, recalled Jani Kovacs, a longtime program director there. That provides another benefit — the opportunity for outreach. Experts like Rolland and Handelman say the preschool years represent the ideal moment to engage families on a Jewish journey, during a critical period when they are considering how their own Jewish identity will evolve. The Haneys, whose children are at Agudath Israel, were impressed that from the moment Julia began there last summer, the community reached out. “I started getting invitations to bring the kids to people’s houses for Shabbat,” said Jacqueline. “We had playdates on the synagogue playground,” she said. They were also matched up with a “buddy family,” congregation members with similar interests and children close in age to their own. “We felt like this was a place we wanted to put roots down.” So they joined CAI. But the change is not as simple as adding a few hours to the school day, experts caution. The time expansion can involve investing heavily in infrastructure to meet state and local regulations and to create a preschool that can compete with secular options. So before expanding hours and possibly space, there are critical questions to ask. “This is not ‘Build it and they will come,’” said Rolland of the URJ. She is leading a community of practice on exactly this issue for Reform congregations, helping them with feasibility studies to assess whether such changes will work for them, and then working together to co-construct the new preschools. Most congregations do not have “money sitting around,” with leaders asking, “How can we spend it?” she said. And in general, synagogues look to preschools as “profit centers,” Rolland said. But for those synagogues that can move past their immediate needs and analyze their preschools strategically, “the returns can be very great” in terms of cultivating tomorrow’s members, she said. The goal, however, isn’t always congregation membership. Zamist pointed out that millennials are notoriously non-joiners. Sometimes, she said, it’s just about “finding a way to get young Jewish families into the synagogue. Having them in the building is a good thing” regardless of whether they become full-fledged congregants. Locally, in addition to Agudath Israel and the JEC (and of course the Union Y, the Brody Family Early Learning Center at the JCC of Central NJ in Scotch Plains, and the Cooperman JCC), a handful of other synagogue preschools have made the move to full hours, approximating the 7 a.m.-6 p.m. model; these include Pine Brook Jewish Center in Montville, the Early Learning Center at Chabad Center of Northwest New Jersey in Rockaway, the Shalom Yeladim-Judie Gerstein Early Learning Center at Morristown Jewish Center-Beit Yisrael, Thelma Reisman Preschool at Congregation Beth El in South Orange, the Mickey Fried Nursery School at Oheb Shalom Congregation in South Orange, and the Early Childhood Center at Temple Beth Ahm Yisrael in Springfield. A few others have expanded partially, like Congregation Shomrei Emunah in Montclair, now open until 4 p.m. Others, like the Iris Family Preschool at Temple Sharey Tefilo-Israel, also in South Orange, are expanding slowly, but acknowledge the future need. “The shift is coming,” said Carol Paster, director of the Iris preschool, which is open 9 a.m.-noon, with extended hours until 3 p.m.
To a large extent, which preschools are making the shift and when depends on the constituency. Heather Brown, the director at Shomrei Emunah, said she doesn’t have the volume of calls she would need to justify longer hours. And another problem would arise on Wednesdays: The preschool shares space with the religious school. It’s the kind of space issue Rolland said comes up often and figures in the considerations of structural investment. One overarching question a Jewish preschool shifting to full-time coverage must answer for parents is “Are you open on Jewish holidays?” The answer is often determined by denominational affiliation. Most Reform schools do not grapple extensively with the issue — they stay open. Orthodox schools, with largely shomer Shabbat and shomer hag families, close on holidays. (Fast days that are not major holidays can be trickier, especially for the teachers who are fasting; at the JEC, they stay open only half a day on those days.) Conservative preschools don’t have a one-size-fits-all response. For its first year offering longer hours, Beth El, for example, will remain closed on all major Jewish holidays. A much bigger challenge, however, is finding excellent teachers willing to work longer hours. Area preschool directors throw everything at this issue: advertising, networking, word of mouth, and heading to on-line sites like Indeed and JED Lab, a Facebook networking site for Jewish educators started by the organization Partnership for Excellence in Jewish Education in 2013. And once they find the right candidates, Zamist and Isaacs said, as employers, they offer plenty of professional development, sometimes funded through grants, often done themselves. Others have expanded the pool of applicants to non-Jews. “Being Jewish doesn’t mean you are a great teacher, and being a Jewish educator does not require that you have to be Jewish,” said Handelman. But at the heart of the issue is salary. As in any field, pay makes a difference. Isaacs said she noticed that the higher salaries offered at the JEC in Elizabeth attracted better-qualified teachers compared with the community she previously worked in. Similarly, Robin Brous, director of the preschool at the JCC in Scotch Plains, said they have less of an issue finding excellent teachers because they put a premium on “moving the needle forward” with respect to salary, more typical of the JCC model. This year, for the first time, the JCC of Central NJ preschool is offering health benefits to its teachers working full-time hours. Synagogues still have a ways to go. According to the Bureau of Labor Statistics, preschool teachers in the United States in 2012 earned a median annual salary of $27,136. In New Jersey, the figure was slightly higher, at $36,970. An article in the Forward in 2010 put the hourly wage for Jewish preschool teachers nationally at $17.50 per hour. Some local synagogue preschools pay significantly less, as little as $12 per hour. In the meantime, as these directors start a new year of preschool, don’t ask them about day care. “We take care of children, not days,” said Zamist.